Wondering how to get your propert claim paid faster? Here are 8 steps! Wondering how to get your property claim paid faster? Wondering how to get your property claim paid faster? Thousands of people are filing hurricane property claims. Are you one of them? The length of time it takes to complete your claim process can be frustrating when you want to get back on your feet. Luckily, it’s possible to beat the wait by following these helpful steps to get your claim paid quickly! A Public Claim Adjuster works on behalf of the policy-holder. Working with a public adjuster can be your best decision you can make during this process. Most of the time, they will handle everything for you…reducing your stress and expediting your claim’s process. When you have tax issues or questions, you contact a CPA…you call a Public Adjuster when you have property damage and need to file a claim. Doing so will make the next 7 steps quick, easy and sometimes unnecessary. Have your insurance agent’s contact information for your records. Your agent may be able to speak with the insurance company and get the process rolling. Or, eliminate the middleman by contacting your insurer’s claims department directly. Call as soon as possible to get things moving. Insurance claims require you to make small repairs like boarding up windows and preventing mold growth, so get started before you meet the adjuster. Take pictures before you make the repairs so that the damages can be part of the evidence for proving your loss. Estimates suggest that Hurricane Harvey will be leaving behind $40 billion worth of damages. Unfortunately, you will likely have a lot of losses when applying for your commercial or residential claim assistance. So, make a list of those losses for accurate claim pay calculation. Provide receipts, lists, videos, and photos as proof. If you were affected by Hurricane Harvey, you may enjoy this article about filing Hurrican Harvey claims. It is more important for your adjuster to see and understand your losses to form a precise perspective rather than solely referencing words on paper. Otherwise, they could miss crucial details or make mistakes that slow down the claim process. Meeting your adjuster face-to-face will help prevent this from happening. From filing the insurance claim to collecting receipts of expenses—like services paid for small property repairs—you need to keep all records and documentation of the damage organized. Not only can you be reimbursed for a settlement, but your insurance provider will have everything they need to press forward. Ensure your insurance company has everything they need, so they don’t have to backtrack. For example, you may still need to fill out a proof of loss form despite submitting evidence. Your state insurance department can help you through the claim process for quicker results. Also, you might qualify for assistance like a Small Business Administration disaster loan or a Federal Emergency Management Agency grant, which can get you paid even faster. 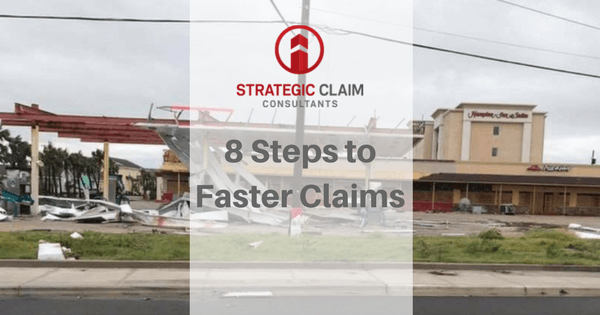 If you are wondering how to get your claim paid faster, a public adjuster is your best solution. Hurricane claim assistance is incredibly useful, but the process can take forever. If you want your pay sooner, contact Strategic Claim Consultants today! Our quality service and knowledgeable experience will help you get your insurance claim paid faster.